Could proton therapy be an option for your cancer? Radiation is one of the three most commonly used treatments for cancer. In fact, according to the National Cancer Institute, about half of all cancer patients undergo radiation at some point during their treatment. One limit of radiation is that tumors are surrounded by normal, healthy tissues and organs that can be damaged by exposure to radiation. Proton therapy, however, is a more precise type of radiation that can deliver higher doses of radiation directly to the tumor and protect the surrounding tissues and organs. We talked with Dr. William Regine, FACR, FACRO, the Isadore & Fannie Schneider Foxman Endowed Chair and Professor in Radiation Oncology at the University of Maryland School of Medicine and executive director of the Maryland Proton Treatment Center (MPTC). MPTC is a state-of-the-art proton therapy center affiliated with the University of Maryland Marlene and Stewart Greenebaum Comprehensive Cancer Center and one of only 26 proton therapy centers in the country. Dr. Regine explained how proton therapy works and the advantages this treatment can offer to patients. PinnacleCare (PC): What is proton therapy and how is it different than standard radiation therapy? Dr. William Regine (WR): Standard radiation uses X-rays, which are called photons. Proton therapy uses positively charged particles called protons. While both photons and protons have the ability to destroy cells, which is how they kill cancer cells, they differ in the way they deposit the energy that’s within tissue. Photons deliver their cell-killing energy in small packets that affect the tissue and organs all along the path they travel through the body to reach the tumor. In contrast, protons deliver almost all their energy when they reach their target—the tumor—minimizing the exposure of healthy tissues and vital organs to the damage that radiation can cause. Standard radiation works well for about 70% to 80% of the people on whom it’s used to treat cancer, and the spread of the radiation dose to surrounding tissue is not significant. But for about 20% to 30% of patients whose tumors are located close to a sensitive organ like the heart, brain, liver, or kidneys, proton therapy can provide them with less risk of damage to surrounding tissue and organs. PC: What types of cancer can be treated effectively with proton therapy? 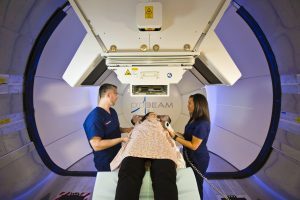 WR: Proton therapy can treat a wide range of cancers, including brain tumors; tumors at the base of the skull; breast cancer; tumors in the gastrointestinal tract; cervical and other gynecological cancers; head and neck tumors; lung tumors; prostate tumors; sarcomas; tumors in the spine; and lymphomas. It’s also safe and effective for children, who are more susceptible to the side effects of standard radiation, and people whose cancer has recurred and who cannot undergo another round of standard radiation because the body’s cells can only withstand a small amount of radiation over a lifetime. Proton therapy is rarely used to treat metastatic cancer, that is, cancer that has spread to numerous different places in the body. At the Maryland Proton Therapy Center, we are able to cure at least 60% of the adult cancers we treat and significantly minimize side effects. For example, for patients with throat cancer, proton therapy can effectively treat the cancer and spare the front of the mouth from the effects of radiation and chemotherapy. For people with lung cancer or lymph node positive left-sided breast cancer, proton therapy can treat the tumors, while protecting the heart from radiation damage. For a patient with a sarcoma, proton therapy lowers the risk of wound complications. PC: Is proton therapy a new technology? WR: No, proton therapy has been FDA approved since 1988. Over 130,000 patients have been treated with this therapy worldwide, 17,000 of them in the last year. What is new are technologies that allow for even more precise delivery of the protons. Pencil beam scanning technology, also known as intensity-modulated proton therapy (IMPT), basically lets us paint the radiation on the tumor like a 3-D printer, creating a radiation dose that is carefully fitted to the contours of the tumor, minimizing radiation to surrounding tissues. We also use image-guided CT scanning in the treatment room to ensure that the treatment is delivered precisely to the tumor. PC: Beyond limiting the dose of radiation to healthy tissues surrounding a tumor, what are the patient benefits of proton therapy? WR: Proton therapy is highly targeted, so we can deliver a more powerful dose of radiation to the tumor. That can have a positive effect on the outcome of treatment, especially for sarcomas and some types of brain tumors. Another benefit is that proton therapy is safe to undergo before or after surgery and can be combined with chemotherapy and immunotherapy. Proton therapy usually is delivered once a day, five days a week, for about 10 to 30 minutes, for five to six weeks or even less, depending on the type of cancer being treated. That can improve the patient’s quality of life because they’re spending less time at the doctor’s office. PC: How do the side effects of proton therapy compare with those of standard radiation? WR: The potential side effects are the same—skin problems like dryness, itching, peeling, fatigue, nausea—but are typically less severe with proton therapy. PC: Is proton therapy more expensive than standard radiation? WR: It can be. At the Maryland Proton Treatment Center, proton therapy is priced at the same rate as traditional radiation therapy. . If you’re interested in learning more, a health advisor can help connect you with the full range of cancer treatment options, including proton therapy.